The farm has belonged to Richard Quinney's family for generations, since first being settled by his great-grandparents fleeing the potato famine in Ireland, and it is the place of his birth and early years. When the house at the Old Place was torn down more than half century ago, the family photograph albums were carried up to the farmhouse. A few letters, some diary entries, and a scrapbook of obituaries survived to preserve a portion of the family history. Added to these materials, the author has drawn from the photographs of his mother's family, from the photographs made by his mother and father as they documented their young lives, and from the many photographs of the early years of the family. This is the story of the several generations that once lived on these few acres of rolling hills and wetlands in a corner of southern Wisconsin. 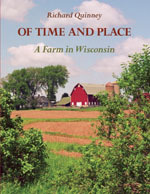 The book concludes with a photographic survey of the artifacts that remain on the farm. The author demonstrates that our lives continue—in body, mind, and spirit—from the lives of those who came before us. We know that our ancestors are not merely of a former time. They are with us always, in our daily lives, just as we will be in the lives of those who come after us.